Handle all OST corruption issues and extract OST emails, contacts, calendars and appointments. Recover selected folders of OST into multiple formats. Restore recovered OST messages to PST, EML, MSG, HTML, EMLX and vCard file. Create UNICODE PST File during conversion OST file and supports both ANSI and UNICODE to convert data of OST file as PST. OST Recovery is professional solution for corrupted or damaged outlook OST file; use this best third party tool for repairing corrupted OST file and recovery OST emails, contacts, calendars, task, notes and appointments. OST to PST Converter Software allows users either complete OST mailboxes items or select the items for selective conversion. It will create UNICODE PST file during conversion data from OST files that will be effortlessly access and open in MS Outlook application supported any versions such as- 2016/2013/2010 and below version. OST Recovery Software allows users to extract emails from deleted folders of corrupted outlook OST file so that easily recover deleted folders emails of OST files along with attachments and convert them into new created PST file. All the conversion process is totally free under trail version of OST to PST Recovery Software; this program fastly recover outlook OST emails and convert Outlook OST file to PST free with emails, contacts, calendars and task etc. Not to worry about accurate data of Outlook OST file at the time of conversion because the OST file recovery software preserve all folders, sub-folders hierarchy and structure as well as maintains emails attributes or formatting while conversion process. Not only convert the recovered OST as PST, but there some another formats presented as like- EML, MSG, HTML, MBOX CSV and EMLX; you can choose any format for recovered OST file data like- emails, contacts, calendars, task, notes and appointments. Not compulsory to convert complete items if you don’t want; just select the folders, sub-folders or emails using check or un-check feature of the software and export only selected items of outlook OST files into PST Outlook file with maintains data integrity. OST Recovery Software easily repair, recover outlook OST Emails, contacts, calendars and appointments. OST file recovery Software will create UNICODE PST file while conversion data of outlook OST file without losing data from OST. Up to what file size limit I can give the Outlook OST file for conversion data into PST file using the software? You can give an OST file of any size; there no size limitation provided just convert any size of Outlook OST files to PST Outlook file. Can I recover deleted folders items of corrupted OST file? Yes, you can use OST Recovery Software to recover deleted folders items of OST File and convert Outlook OST file to PST Outlook file. What formats does OST Recovery Software give to Restore OST emails or attachments? 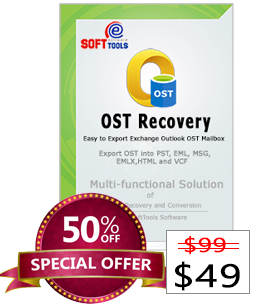 OST to PST Recovery Software provides “PST, EML, MSG, HTML, MBOX, EMLX and CSV” to recover and convert outlook OST file. Can I recover attachments items of OST file with Software? Can I convert selective folders of my password protected OST file to PST file? Yes, with this software you can convert selective folders of password protected OST file into PST file.